Please review all of the information below to ensure you have an enjoyable event experience! Al & Alma’s has multiple locations. The boat will be departing from 402 Lake St E, in Wayzata, at 11:30 am, sharp! Arrive early to check-in and get your name badge. We recommend arriving 15-20 minutes early to give yourself enough time to park, and head to the dock and board the yacht. The address for the event is 402 Lake St E., Wayzata, MN 55391. Here is a map of the area as well. This is the 56th consecutive sold-out Minnesota Recruiters event and there will be many great networking opportunities! Don’t forget to bring your business cards. Please bring an extra business card for both the prize drawing. To be eligible for the prize drawing we will have, please “follow” the NEW Recruiters Network Instagram page. This is not a business development opportunity for vendors, suppliers, or recruiting agencies. Violators might be thrown overboard! The dress code is up to you. Some individuals will be coming from home and others from the office. Just arrive comfortably to spend 2 1/2 hours on a boat with 80+ degree weather and be ready to engage in some great dialogue. Pictures will be taken throughout the event and will be uploaded on our Facebook page. The hashtag for all MN Recruiters events is #mnrec. Your registration includes the cruise, lunch & dessert, and unlimited beverages (soft drinks and water). There is a cash bar available if you are interested. We are unable to process cancellations as the final guest counts have been provided. If you can no longer make the event and would like to transfer your ticket to a colleague, provide them the link to this page so they have all of the required information and have them check in under your name. Please note the name badges have already been printed. The event is from 11:30 am – 2:00 pm and the yacht will leave right at 11:30 am. Again, please find parking, park, and arrive at the dock for your name tag and boarding no later than 11:20 a.m., as the yacht will be leaving at 11:30 a.m. (are you seeing a trend here)? Al & Alma’s departs from 3 different ports. We are leaving from the Port of Wayzata at 402 Lake St E. (left to the historic train depot). 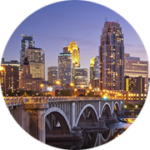 A big thank you to both Jobvite and Versique – the 2018 Minnesota Recruiters Underwriting Sponsors – for their support of our community.